The book is “strictly for busy people” (and dwellers of bed-sits, the skint and dieters, the deserted husband, or “for beginners”). Being currently not particularly busy, not living in a bed-sit, not dieting, ok a bit skint, but certainly not a husband, I decided I would fall into the category “beginners”. 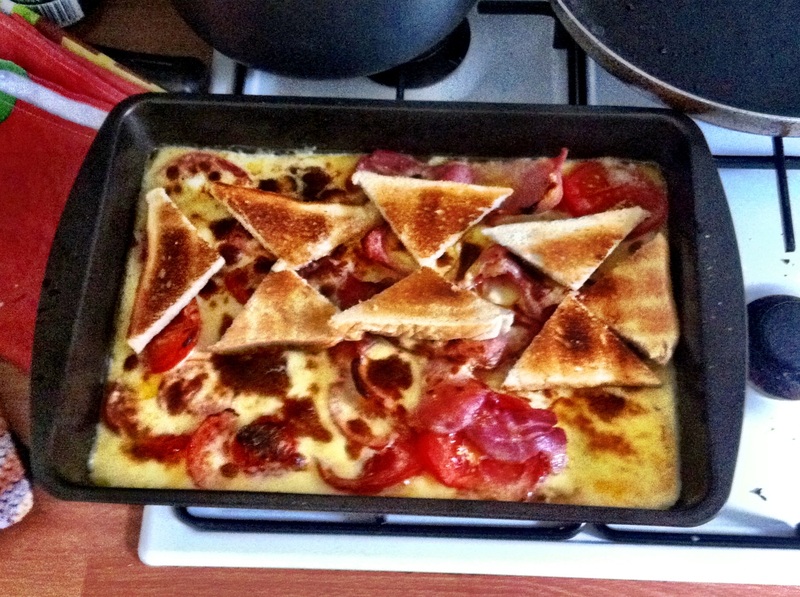 Seeing that I’m not really one (a beginner, that is), I should be acing my recipe of choice, “Tomato Rarebit”. However, the recipe looked simple enough (in fact, so simple that “you can safely leave the menfolk to cook this for themselves”), and so I started my quest confidently, my good friend Catia acting as photographer and time-keeper (and starving stand-in husband). But dear reader, I have to confess – I failed. And badly. I am useless. Even my (non-existing) husband would manage to assemble the below recipe in 15 minutes, whereas I, oh shame, have used twice the allotted time. Divorce on grounds of failing to provide nourishment to the head of the household in a quarter of an hour surely is the only deserving and reasonable outcome. 3) They had a weird way of melting cheese in those days, using a bain-marie. I faithfully stuck to the instructions in the book and used one. It didn’t work. After 5 minutes, I transferred the cheese to a pot, but alas, this cost precious time. The recipe is indeed easy-peasy. Other than using that new-fangled machine called “a toaster” instead of grilling the bread, I didn’t make any modifications – rather, I went out of my way to try and recreate that 60s feeling by buying cheap bacon rather than Saintesco’s finest, and stuck otherwise with the local corner shop for the other ingredients, too. All went according to plan, apart from the cheese fiasco – I thought initially, the cheese needed more milk sitting as it was in the bain marie, but when I transferred it into the pot, I realised I had far too much milk – even hastily added flour did not rectify this. As a result, the cheese sauce was a lot thinner than intended and didn’t brown off as much as I wanted. To my surprise, the end-result was nevertheless not a million miles away from the picture in the book, given that I didn’t have a smaller tray. As for the taste – it was perfect comfort food for this sorry excuse of a summer we’re having at the moment [sorry, it’s taken me a while to get this up – E]. The Jet Stream can fugger right back off to where it belongs. Catia was very happy (she was starving though, so I guess she probably would have enjoyed seasoned cardboard at the time). We both agreed that thicker cheese sauce would be good. Also, there is no way that two slices of toast are enough – but they probably don’t make them like they used to back in the day. Other than that, it was fine. A word on pricing. All in all, my shop cost me £5. If we generously discount the 2 bacon rashers I used for something else, the bread that wasn’t eaten as part of the dish and the bit of milk I used (not included in the £5), we could mark the price at around £4.20. 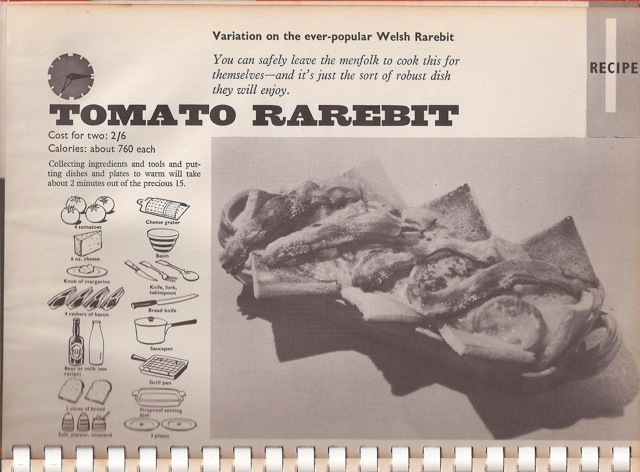 The cookbook gives the price as 2/6 (or 0.125 of an old pound), which according to this website is worth either £1.86 using the RPI or £3.91 using average earnings. The RPI is a measure of price inflation, i.e. the difference between the cost of average goods between two years. It takes into account price inflation, but not wage inflation. The average earning thingy is a bit trickier, and it isn’t very well explained, so this is a bit of guesswork on my part. The £3.91 would be the amount of the average income that would have to be spent to buy the equivalent of what 2/6 bought in 1965. I think they might refer to purchasing power, which indeed would be the more accurate measure. In other words, what 2/6 bought back then buys you nearly the same as it did in 1965. I think. So, to sum up, a nice winter warmer, but nothing too exciting. I think I shall try the “Plaice Extase” next, if only because the name is so incredibly stupid that it has to be worth a blog. *that would be me, then. ** to be fair, according to this [hilarious – E] article, She tried to be a bit different up until the 1980s. *** Incidentally, She Magazine existed until August 2011, when it was abruptly shut down. I’m sure it’s not a great loss, given that most women’s magazines are about as feminist as Louise Mensch and Philip Blonde. It is good to know though that the first hit you get for She Magazine on Google is now for an LGBT magazine in Florida. Rock on Sisters! 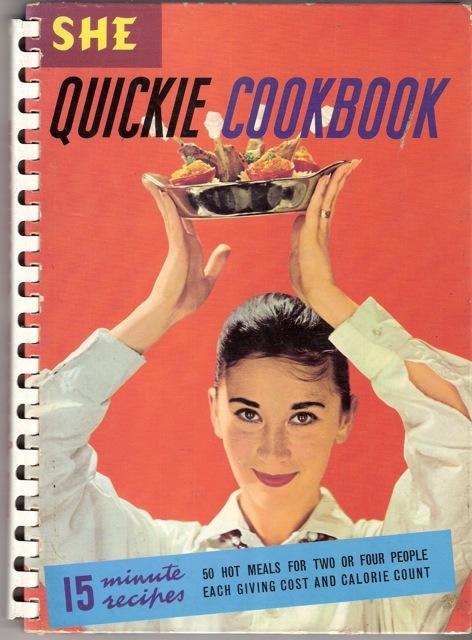 This entry was posted in 1960s, She Quickie cookbook and tagged bacon, bread, cheddar, tomato. Bookmark the permalink. May I just point out that it wasn’t Elly’s tardiness that was cause for the delay, but my own slackness in writing it up. Alas, since the summer has abandoned us after a brief, tantalising glimpse, the Jet Stream can still go and shut the door from the outside. 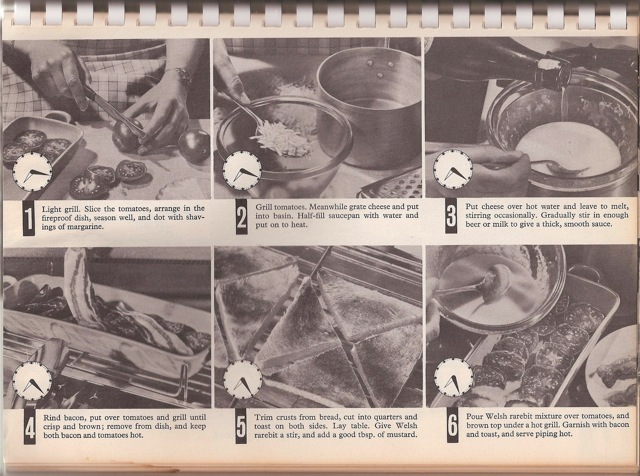 I have never heard of melting cheese in a bain marie before, and I was born in the 40s. That really is a strange way of going about things. Whilst having been aware of She magazine in those days it would have been unaffordable for me, all my wages having to be spent on food and heating. It is interesting to note that it was founded by Nancy Spain and her partner. Interesting links in your post too. Re the elaborate financial comparison:- in the mid-60’s a friend of mine bought the ingredients, in a supermarket, for a shepherd’s pie, for 4 people, plus some frozen peas to accompany it, and was horrified to get hardly any change from a 10/- note (now 50p). I can understand that, in 1966/67 if I had 10/- left on Wednesday, it would feed the two of us until Saturday. Money had more value then and even more when my parents were born at the start of the 1900s. Salada, the site suggests that 10s in 1965 would be £7.55 today, which sound about right for 800g mince, 4 spuds, 2 onions + carrots and a bag of frozen peas. Yes – I wasn’t arguing, just giving another example.